This digital collection features a reproduction of a photocopied diary written by Ferris Wellman Myrice of Deshler, Ohio, while in service with the 332nd Regiment in Italy during World War I. A transcription of the diary is also provided. A photocopy and written transcription of the original diary may also be accessed at the Center for Archival Collections. View the item catalog record. 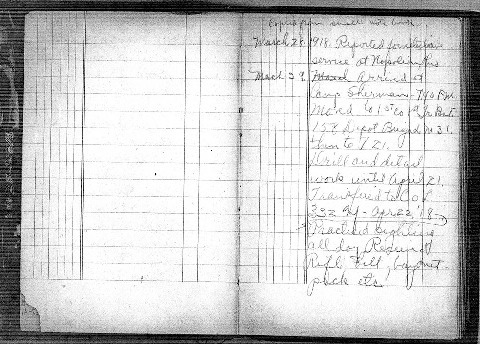 Photocopy of a diary of Ferris Wellman Myrice of Deshler, Ohio, which he wrote while in service with the 332nd Regiment in Italy during World War I.